One of my favorite seasons will be here soon. The leaves will be changing colors, we will be taking field trips to apple orchards, attending Fall Festivals, having campfires, making warm soups, wearing cozy sweatshirts, and doing lots of baking. Yes, the season is Fall (a.k.a. Autumn). The only problem with the Fall season is that the Winter season follows it. Winter is my least favorite season, and I have to try hard to find things to be thankful for during that time of the year. 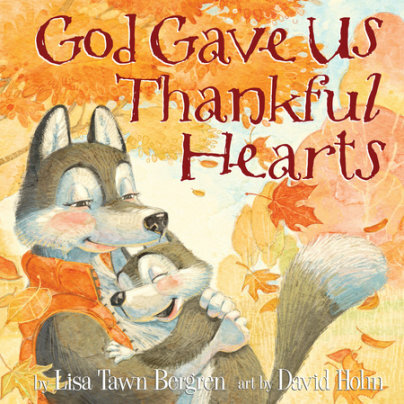 Little Pup, a sweetly illustrated wolf cub, has the same dilemma in the book, GOD GAVE US THANKFUL HEARTS by Lisa Tawn Bergren. But, Mama Wolf has a conversation with Little Pup about how there's a reason for us to be thankful in every season. She and Papa wolf give him examples of things they are thankful for, and show Little Pup how God wants us to have a thankful heart. 1. At one point, Mama Wolf says, "The trick to having a thankful heart is thinking about the things that make us happy, rather than the things that don't." That is a concept based on Philippians 4:8 - Finally, brothers, whatever is true, whatever is honorable, whatever is just, whatever is pure, whatever is lovely, whatever is commendable, if there is any excellence, if there is anything worthy of praise, think about these things. These are all good reminders for children, as well as adults. So, if you have younger children or grandchildren, this would be a great book to snuggle in and read along with them this Fall season (or any season) of the year. NOTE: I received this book from Blogging for Books for the purpose of this review. I have expressed my own opinion.